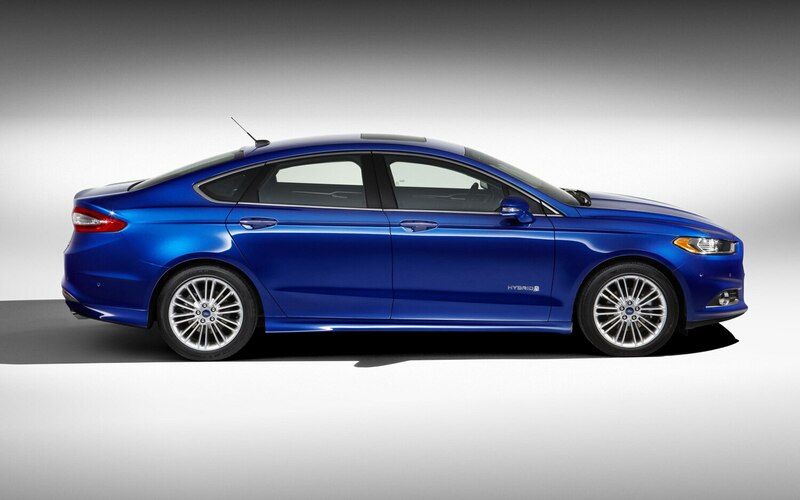 Ford understands that in the hybrid arena, it’s all about the MPGs. Thus, the company is justifiably proud that the new Fusion Hybrid brought home EPA ratings of 47 mpg city and 47 mpg highway, numbers that not only well surpass the 41/36 mpg ratings of the previous model but, more importantly, solidly beat the target Toyota Camry Hybrid’s 43/39 mpg—not to mention the also-ran Hyundai Sonata Hybrid’s 35/40 mpg. 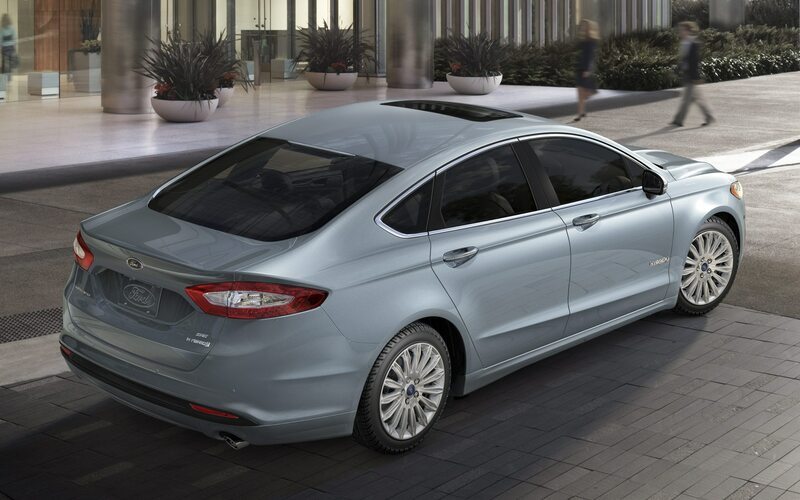 If the Fusion Hybrid’s figures don’t quite match those of the Prius (51/48 mpg), they’re still good enough to make the Fusion the highest-mileage midsize sedan, a boast you’re sure to hear Ford shouting from the rooftops. Arriving in Los Angeles for a first drive opportunity of the new Fusion, we were given access to the Hybrid first, for a 14-mile loop from Santa Monica, out briefly onto the Pacific Coast Highway, back into town on Sunset Boulevard, then through some more dense neighborhoods back to our starting point near the Civic Center. It was hardly a thorough shakedown but it was enough to develop some initial impressions of the Hybrid—and, by extension, of the new Fusion. 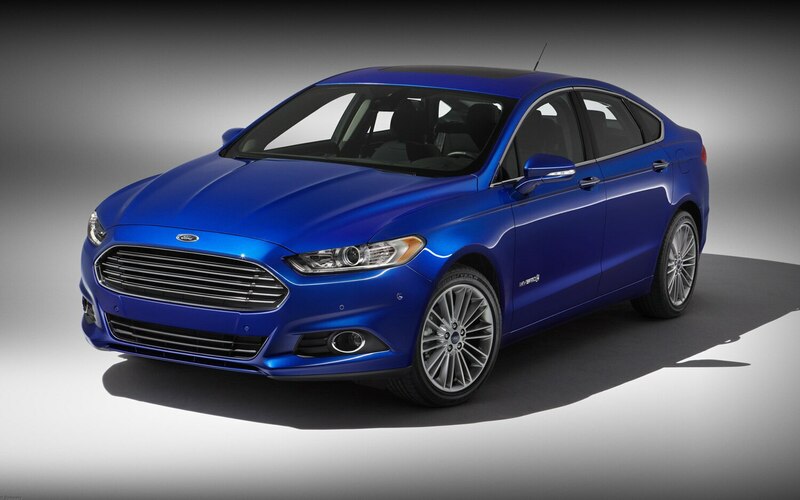 The Fusion Hybrid switches to a new powertrain—shared with the C-Max—that features a smaller gasoline engine than before. It’s still an Atkinson-cycle four, but it’s now a 2.0-liter rather than the previous 2.5. Despite the downsized engine, the total system power output is down by an inconsequential 3 hp, from 191 to 188 hp. 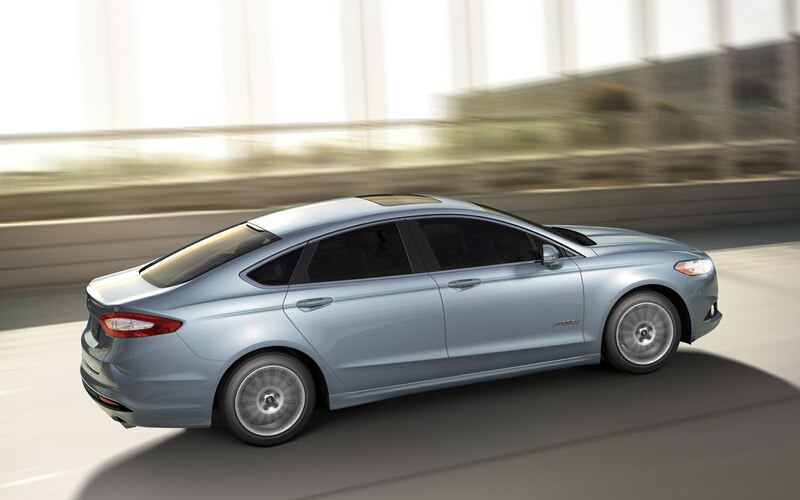 There’s also a new electric motor, and the Fusion Hybrid is able to spend more time in EV mode, thanks to a lithium-ion battery that’s more powerful—but smaller and lighter—than the previous nickel-metal-hydride unit. The battery alone can drive the car via the electric motor at speeds up to 62 mph, versus 47 mph previously, which of course helped the EPA highway rating. We didn’t get close to that speed on our city loop, however. And we didn’t have enough open road to spend much time coasting along in EV mode. Instead, it was a lot of stopping and starting, accelerating and braking. Under those circumstances, the most impressive aspect of this powertrain is the job Ford engineers have done at making engine start-up and shutdown almost imperceptible. You can hear the engine when it’s running but there’s no shudder or vibration as it turns on and off. The finessing of the regenerative and friction braking is less successful. The regenerative brakes are grabby at all but the lightest touch, and the transition to friction braking is not seamless. Naturally, the Hybrid uses electric power steering, and it’s overly light at parking-lot speeds, becoming merely light once you’re moving along. The ride quality is a happier story, with the Hybrid gliding over the few surface irregularities we encountered on our route. The previous Fusion Hybrid ushered in the fanciful, and variable, color-screen monitoring of hybrid system function—and driver coaching. The new one is similar but evolved. Reconfigurable screens again flank the speedometer. As before, the right one grows vines in response to eco-friendly driving. The left one used to have a ball-and-bar that moved left and right to help a driver see the point at which the gasoline engine would awaken from its slumber, but that graphic supposedly got mixed reviews and it’s gone. There’s a new variation on the coaching graphic, and drivers can also get a report card with three bar graphs, for acceleration, braking, and coasting, that are longer or shorter depending on how economical you were in those three areas. Also, with each stop, a battery icon says what percent of the potential regenerative energy you recovered; and a readout tells the distance traveled in EV mode. Of course, there is also fuel economy data, by interval and an average. In other screen-related news, the Hybrid does offer MyFord Touch, but it’s optional. Unfortunately, flat-panel, touch-screen HVAC controls are standard (here and in all Fusions). At least there are volume and tuning knobs for the stereo. The standard cloth upholstery is eco-friendly (made from recycled plastic) but it’s also polyester-like; buyers can upgrade to leather. New with the 2013 Hybrid is a fold-down rear seatback and a trunk pass-through, thanks to the more compact battery. The battery still creates a pronounced lump in the trunk floor, however, and reduces total trunk space from 16 to 12 cubic feet. Another number that’s smaller than last time is the price. 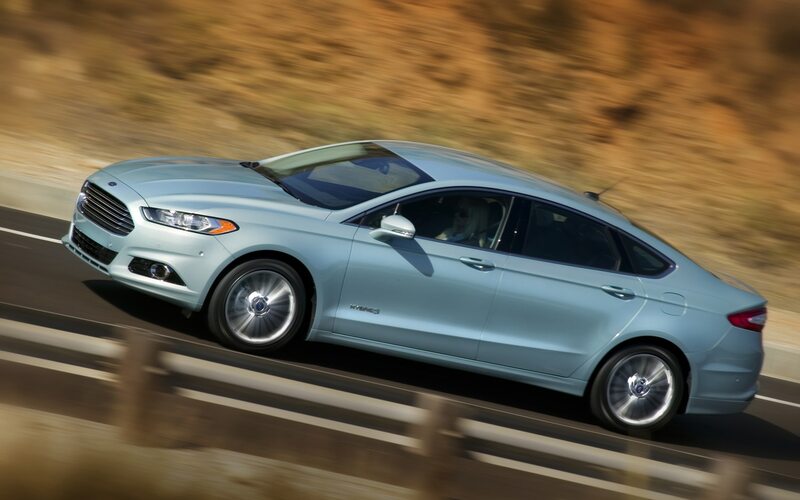 The 2013 Fusion Hybrid starts at $27,995 (with destination). That’s $1400 cheaper than the 2012 model, but is still $2005 more than a Camry Hybrid and $2145 more than a Sonata Hybrid. Ford marketers see their Hybrid as a much more compelling proposition than before, due to its higher mileage and lower cost premium. They expect gas-electric Fusions (the Hybrid and the plug-in Energi) to account for as much as 1 in 5 Fusions sold, versus 1 in 20 previously. These fuel-economy figures are indeed compelling. Although some aspects of this driving experience are unfortunately hybrid-like, the newest gas-electric Fusion has nailed the three most important aspects of a hybrid: fuel economy, fuel economy, fuel economy. It’s a mileage champ, first and foremost.